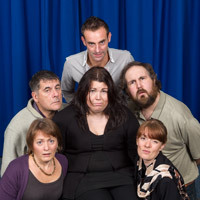 Last rehearsal before Christmas in the bag and two weeks holiday for the cast. (Otherwise known as line learning time). Set painting starts tomorrow, but right now a pause, a cup of tea and a huge thank you to everyone across the city for their amazing donations of kitchen cupboards, fridges, sinks carpets etc that means we now can build three kitchens for one stage, for Naomi House Hospice. Appearing for the first time in public are the party guests, posing nicely for a jolly Christmas snap. Funny bunch aren’t they. Can you work out from their faces who is who? Marion – Someone please take the gin off her.